A Barbados Government Minister gave commercial banks a tongue-lashing today and accused them of targeting politicians. 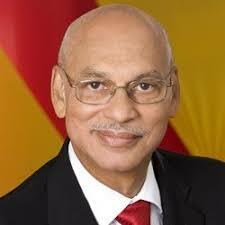 Minister of International Business Ronald Toppin, who was speaking in the House of Assembly during the debate on the Companies (Amendment) Bill, read from a Scotiabank letter which notified his St Michael North branch that the constituency’s bank account would be closed. The lawyer said he had a serious problem with international bodies, commercial banks and all other institutions who seemed to be targeting politicians. “What I will continue to have a problem with is what appears to be unrelenting targeting of the politically exposed person. If you look at the amendment to The Charities Act and I am sure it is duplicated in The Companies Act, there are nine categories of persons who would be deemed to be prominent public officers … of the nine, three are dedicated to people politically-associated or politically-involved. He continued: “It was intended to make sure that nobody at all would ever think about politics. I am at a loss to find out what is the fixation with a political person. It is an honourable job and somebody gotta do it. You are always targeted. When does it end? What is wrong with being a politician? During his contribution Attorney General Dale Marshall recalled enduring a lengthy period in order to get a transaction approved and completed. He said he was told by banking personnel his delay was due to the fact that he was a “politically-exposed person”.